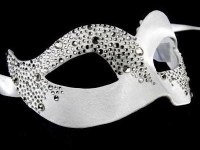 Simply Masquerade brings you this stunning Gatto Conquista Venetian Masquerade Face Mask that is just the thing to add wow to your party wardrobe. Showcasing vintage-inspired style that takes glamour to the max, this stunning party mask features beautiful golden swirls on a endearing aged effect antique Craquelè white base. Create a modern and contemporary style with this fabulous feline mask which is just right for a special night out and will look amazing with your outfit. All our Venetian face masks are hand made in Venice so will be slightly different patterns etc.